Russia’s strong antigay legislation has been the dark cloud over this years Winter Olympics being held in Sochi, with a plethora of human rights organisations speaking out and urging the I.O.C. to take action, claiming that Russia’s anti-gay propaganda laws bely the spirit of the Olympic Games. This movement has received an overwhelming degree of support from the international community, including, of course, the legend that is Stephen Fry. 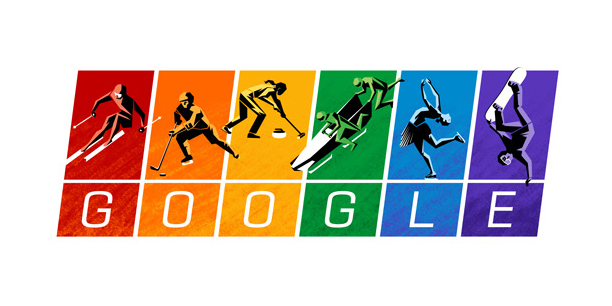 But the big news comes from Google, as their Doodle acknowledging the opening of the Winter Olympics clearly supports the LGBT community by overtly using a rainbow flag of colours, as well as quoting from the Olympic charter: “The practice of sport is a human right. 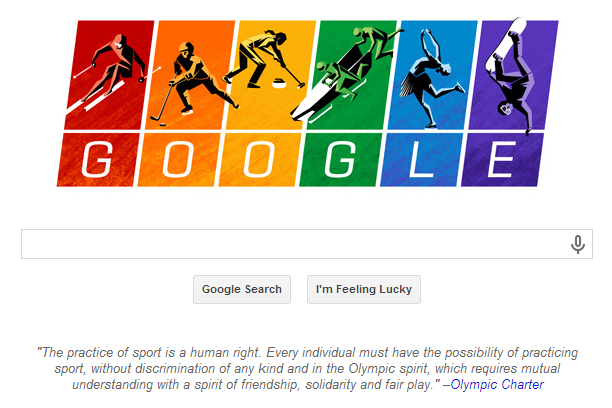 Every individual must have the possibility of practicing sport, without discrimination of any kind and in the Olympic spirit, which requires mutual understanding with a spirit of friendship, solidarity and fair play.” This Doodle is not limited to the UK and US, but proudly appears on google.ru aswell, which is undoubtedly the most important place to show their support. This is a fantastic example of a company using branding to present a message to the world that, through the use of design and imagery, melds an important message to their brand identity, creating a strong association for the consumer. It adds depth to the brand, allowing consumers to understand them better, and on a more personal level by expressing values and beliefs of the brand that people can relate to. Channel 4 have also employed a similar device by altering their branding to incorporate the rainbow colours, again showing support for the LGBT community and breaking the barriers of the business/consumer relationship. It is fantastic to see such huge companies proudly showing support for this important message of acceptance, diversity and inclusion.